Genuinely involving people in discovery, innovation and discussions about the future. This commitment drives everything the Royal Institution does, from its intellectually stimulating public events and world famous CHRISTMAS LECTURES® to activities specifically tailored to capture the imagination and curiosity of young people. 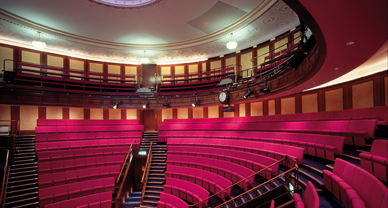 The Institution were refurbishing their prestigious, listed headquarters building, including the historic Faraday theatre where these CHRISTMAS LECTURES® and many other events take place. Our role in this refurbishment was to advise the fit out designers on completing the refurbishment without the large, newly installed air conditioning units adversely affecting the existing acoustic standards of the lecture room. Testing the noise levels of the substantial air conditioning units. Providing guidance to the designers on how to acoustically hide the air conditioning equipment without affecting the units’ functionality or effectiveness.